Hapuku Lodge and Treehouses are proof you can surround yourself with breathtaking luxury and still have a positive impact on the environment. Built by a family of architects in 1995, this eco-friendly dwelling is hugged by the Kaikoura Seaward Mountain Range on one side and offers amazing views of beautiful Mangamaunu Bay on the other. The lodge is surrounded by a sustainable deer stud farm that includes an olive grove, fruit orchards, and a vineyard. You'll love exploring the grounds and sampling its bounty in the dining room, where you can savor fresh local ingredients at in front of a blazing fire. Unique New Zealand accommodation, nested 30 feet above the ground in the canopy of a native Manuka grove. 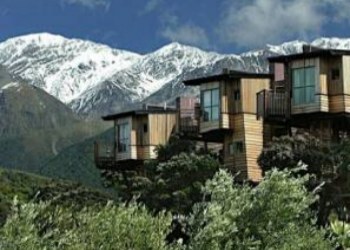 Each Tree House has spectacular views of Kaikoura's dramatic mountains and surf-washed Pacific coastline. As with the lodge, the treehouses are meant to be a contemporary complement to the natural environment. Their exteriors are clad in native woods and copper shingles. Large windows bring the tree canopy right into the bedroom. Interior furnishings were crafted by local woodworking friends. 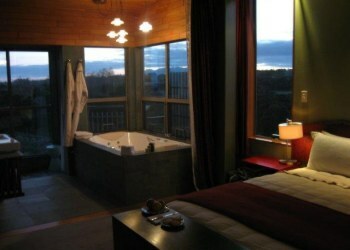 The one bedroom Tree House is a favorite for honeymooners and couples looking for a luxurious tree top stay. The two-floor Tree Houses were created with families in mind. They include the upper bedroom treehouse for the parents, with a lower bedroom (what we call the Lower Branch Tree House) connected by an interior staircase, for the children.